Juvale's Round Aluminum Foil Baking Pan Set includes 100 pieces of thick gauge, heavy duty, aluminum foil pans. Engineered with quality in mind, its sturdy construction prevents foil pans from bending and crushing easily. Full curl rims provide a rigid grip that allows easy handling and serving. These aluminum foil pans provide superior heat conductivity to evenly heat up food and can withstand temperatures up to 500 Fahrenheit. They are great for catering buffet parties and are ideal for baking cakes, pies, tarts, flans, cooking, broiling and more! These aluminum foil pans are recyclable and provide a great way to transport and serve delicious food! 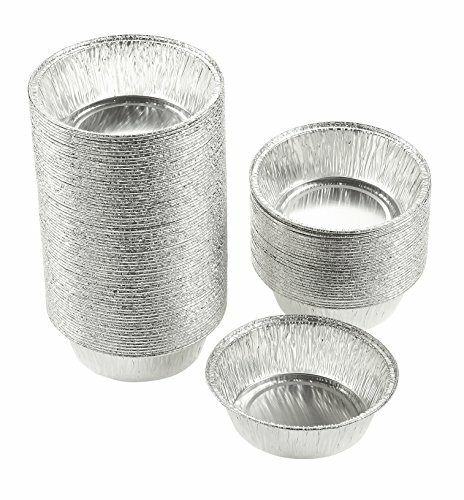 BULK ALUMINUM FOIL PANS: Includes 100 pieces of disposable lightweight aluminum foil baking pans for pies and tarts. QUALITY: Made from thick gauge, heavy duty, quality durable and recyclable aluminum foil; full curl rims provide sturdy grip for easy handling and serving. MULTI-PURPOSE: Suitable for baking cakes, pies, tarts, flans, cooking, broiling and more. Ideal for the food service, perfect for household, restaurants, cafeteria, takeouts and catering; safe for use in freezer and oven. DIMENSIONS: Top outer measures 4.9 inches in diameter; top inner measures 3.5 inches in diameter; depth is 1.5 inches.